Coastal bulkheads are most often referred to as seawalls, bulkheading, or riprap revetments. They are constructed along shorelines with the purpose of controlling waterfront erosion. Dredging is an excavation carried out underwater, in shallow seas or fresh water areas with the purpose of keeping waterways navigable or replenishing beaches where too much sand has been lost because of coastal erosion. Erosion control is the practice of preventing or controlling wind or water erosion in agriculture, land development and construction. Effective erosion controls are important techniques in preventing water pollution and soil loss. A jetty is any of a variety of structures used in river, dock, and maritime works which are generally carried out in pairs from river banks, or in continuation of river channels at their outlets into deep water; or out into docks, and outside their entrances; or for forming basins along the sea-coast for ports in tideless seas for various purposes including directing currents or accommodating vessels. A pile driver is a mechanical device used to drive piles into soil to provide foundation support for structures. A slipway, boat slip or just a slip, is a ramp on the shore by which ships or boats can be moved to and from the water. Also known as rip rap, rubble, shot rock or rock armor — is rock or other material used to armor shorelines, streambeds, bridge abutments, pilings and other shoreline structures against scour, water or ice erosion. 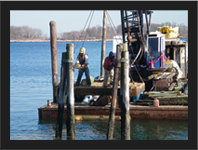 Salvage encompasses rescue towing, refloating a sunken or grounded vessel, or patching or repairing a ship.